Lightly toast coconut in a moderate oven (300°F) or toaster oven in a pie tin until golden, 5-8 minutes. Combine toasted coconut with nuts in a bowl. Place frosted cornflakes in a sealable plastic bag and crush into small bits. Add cornflakes to coconut and nuts. Scoop ice cream into dessert dishes and sprinkle liberally with topping. In Recipes-list.com we have selected the most viewed recipes from category - uncategorized . Enjoy the best recipes specially selected for you! 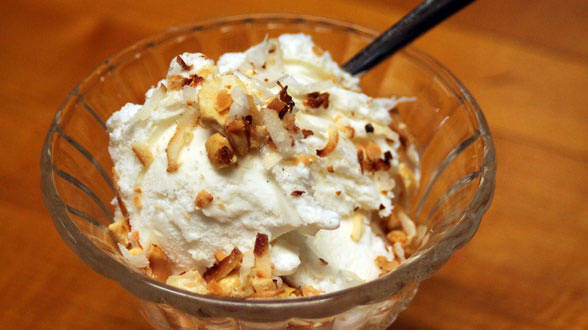 Ice Cream with Toasted Coconut Topping is the right choice that will satisfy all your claims.